After volunteering in Botswana earlier this year I am going back in October to see some of the kids in the school I worked at again and to help setting up some more orphan projects with a group of volunteers and therefore I have started ‘baking for charity’ again. I am getting involved hands on, on these projects but I am also raising funds for the charity, the Botswana Orphan Project and one of the ways of doing this is by baking cakes and giving them out for donations in my office. Admittedly, it’s a very slow way of raising money (and maybe even a bit of a false economy if you consider the costs in making a cake, which a donations of £1 a piece hardly covers…) but I like baking and so far, my office colleagues like eating. The easiest things to make for these charity bakes – mainly, for transport reasons – are muffins or loaf cakes, and I thought I’d share a receipe for one of the later, a Lemon Courgette Loaf Cake, which can also be served as a tasty breakfast cake. Don’t be scared of it containing a vegetable – you’ve probably had carrot cake and now it’s time to broaden your (vegetable cake) horizon! 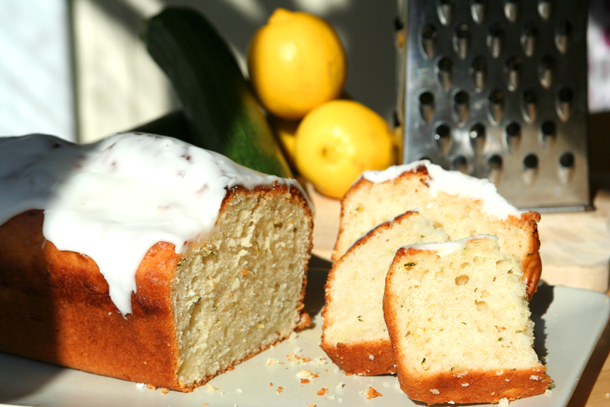 It’s very easy to make, sweet yet lemony, and the grated courgette along with the buttermilk keep the cake moist. And, you’ll need neither scales nor an electric whisk to give this receipe a go – so why don’t you this weekened?! Grease and line a 9”x5” loaf baking tin. Grate the courgette until you have a cup full of it. Don’t peel the courgette, as the little green spots from the skin add a nice touch to the cake (wash it first, of course). In one bowl mix the flour with the baking powder and salt and set aside. In another, larger bowl whisk the 2 eggs with a balloon whisk. Then add the oil and sugar and whisk them all again. Now add the buttermilk, lemon juice and lemon zest and blend everything together, before folding in the grated courgette. Finally add the flour mix from the bowl you set aside earlier, again folding it in with a balloon whisk. Pour the cake mix in the prepared loaf tin and bake for about 40 – 45 minutes. Do the toothpick test to know when it is ready and take it out of the oven, as soon as the toothpick comes out clean. Cool in the tin for 10 minutes then turn the cake out on to a wire rack and let it cool completely. For the glaze, using a spoon mix the lemon juice in to the icing sugar in a small bowl. Keep stirring until there are no lumps and the consistency is thick but pourable. Drop the glaze on top of the cake, helping to spread it with a knife (keep repeatedly cleaning it in hot water as you keep icing) and letting it drizzle down the sides (you may want to keep some paper under the wire rack as any spillage will be very sticky). Let the glaze set and serve! This entry was posted in Cakes and tagged cake, delicious, easy, easy recipe, eggs, frosting, oven bake, quick recipe, recipe, sweet, tasty, treat, vegetable cake, vegetable in cakes, zucchini. Bookmark the permalink.